This Tough-1 Nylon/Poly Bridle/Halter Bag is constructed of durable nylon/poly with soft poly lining for extra protection. 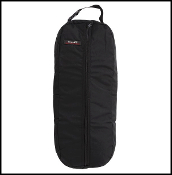 It has a full zipper for easy access and a durable nylon web with a clip on handle. It is a manageable 25" length with a 3 1/2" gusset. It has a quick-grip hanger inside to hold the halter/bridle in place.